I played under Coach my junior and senior years. I spent my sophomore year as an exchange student in Sweden where I played junior hockey. 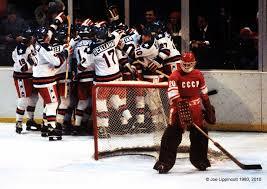 Inspired by Team USA’s gold medal performance at the 1980 Winter Olympics, I was a hockey fanatic. Coached figured that the Swedes enhanced my game. He expected a lot but quickly became frustrated with me. He always chewed me out. ”Miller, you’re hunched over like an old man. Is your stick too short? Keep your head up!” I skated well but my tunnel vision drove him nuts. A tough fellow, even Coach had a few challenges. “Miller, come here!” he commanded at practice night. “Where’s your head at?” A cough drop flew from his mouth when he yelled. 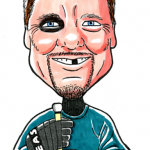 Coach played goalie in college and lost two front teeth courtesy of an errant hockey puck. He wore dentures to school but removed them for practice. The cough drop shot through his toothless gap and landed between my skates. I grinned as the lozenge froze to the ice. “You think that’s funny? I’ll show you funny. Skate some laps!” he growled. We eventually connected via phone. He voice was softer than I recalled. “Eric, you played early in my career and I remember those days like yesterday. Except for when I coached my son those were among my favorite years.” We talked about former players then changed the subject to family. I gave him the 35 year data dump. I told him life was good but complained that Chico (California) lacked ice hockey. “I’m playing in a local in-line hockey league though, Coach. I’m one of the older guys. And my passing has improved… to fair.” He laughed. 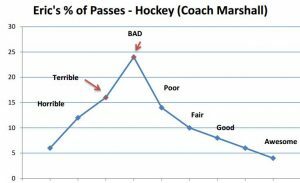 Hockey coaches aren’t known for their cuddliness. Though Coach was tough on me I wanted him to know that I appreciated him. His corrections were never personal. He sought to help me become better. Visit my main Etc. Guy blog and visit (and LIKE) my Facebook page. This entry was posted in Sports and tagged beer league hockey, coaches, exchange student, hall of fame coaches, hockey fans. Bookmark the permalink.